I would like everyone to know that it is very strong! Built like a fortress! 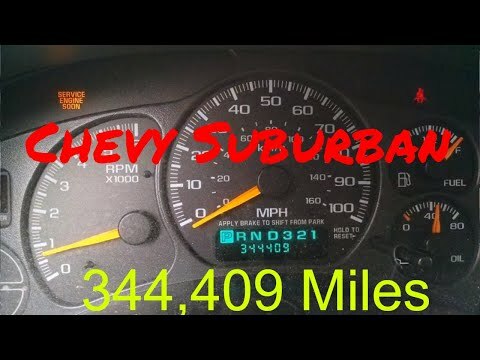 I bought my Chevy Suburban in 2000 brand new. At first, I thought that it was too big and a bit overkill for my family. As time went on, our little family grew. I had five girls all in ballet and we took them everywhere in our awesome truck. It was strong and always made me feel safe. In bad winters, we powered through the snow like nothing! We had very miner mechanical issues with it, and routine maintenance kept her going. on long car rides,we always felt comfortable. I love my Suburban and would buy one again without question. Since I don't need as many seats now, I would really consider a Tahoe. I purchased this 2001 suburban in July of 2017 and so far has needed minor repairs. The power steering hose had a leak and I have had to replace the spark plugs. Also, I get the oil changed every 3 months. I have to add oil quite often and the coolant is leaking somewhere. So at 237, 000 miles, it seems to be doing pretty good. It is been a reliable vehicle thus far. My daughter feels safe in it. I do a lot of in town driving so it needs quite a bit of gas. Overall, I would rate this vehicle at a #8. Very blessed to have it and would highly recommend a Chevrolet suburban. The suburban is very reliable even during winter and cold. It gets great gas mileage it has 3 rows of seating and a lot of room. In the back. It is a good family vehicle and great for kids. The downside is if you need to get parts for it especially under the hood parts it can only match the same year which can be difficult to find and buy. Yes it has its problems and flaws but overall a good vehicle especially if you live somewhere that is a colder climate. This is the only vehicle I have had so far that has not had a lot of issues with cold or winter.